We first reported two weeks ago on the possibility that the first Samsung Android Go handset might be in the pipeline. The company is yet to confirm if it’s going to launch an entry-level device as part of the Android Go program but there’s enough circumstantial evidence available right now to support that possibility. Another piece of evidence has now surfaced which hints that the Samsung Android Go handset has cleared yet another hurdle and is on its way to an official launch in the coming months. For those who are unaware, Android Go is an iteration of Android 8.0 Oreo that’s heavily optimized for entry-level devices. All of the best features of Android are packaged inside a lightweight ROM that can even run on devices that have less than 1GB of RAM. To deliver a fully optimized experience, Google has also developed Go versions of its main apps like Maps, Gmail, YouTube, Files and more so that those with an Android Go device can get the best possible experience on an entry-level smartphone. Word on the street is that Samsung is going to launch its first Android Go smartphone as part of its entry-level Galaxy J series with some suggesting that it might be called the Galaxy J2 Core. 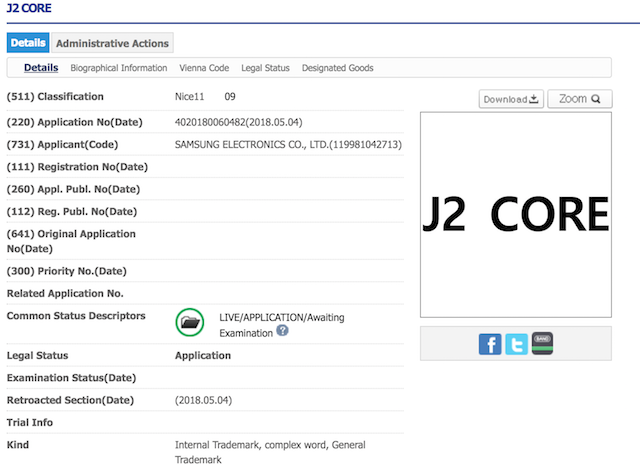 Samsung’s recent trademark application filed with the Korean Intellectual Property Office has surfaced online which reveals that the company wants to trademark the term J2 Core in the mobile phones category. The trademark is certainly one hurdle that an unannounced device has to clear first before it can be brought to market. However, it’s pertinent to mention here that Samsung does have a habit of trademarking monikers long before it launches a device, so it’s within the realm of possibility that its first Android Go handset might be launched with a completely different moniker.